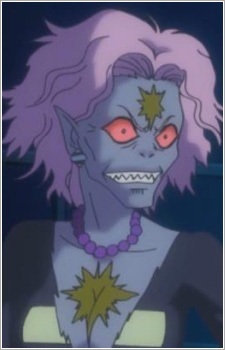 Morga was a Youma summoned by Jadeite to drain energy from unsuspecting women as part of the Dark Kingdom's continuing energy-gathering efforts. She appeared in both the first anime episode as well as the first manga act. As part of Jadeite's plan, she locked Naru's mother in the basement, then took her place at the jewelry store and put cursed jewelry on sale at very low prices. The jewelry was meant to drain the energy from whoever was wearing it, and since many women were brought in by the discounts, the plan was very successful. Once all the victims had been drained of their energy, Morga transformed into her true form, an ugly creature with brown skin and messy brown hair. Her body was very flexible; because of this she was able to twist her neck completely around, as well as stretch her arms to incredible lengths. When Naru discovered that her "mother" was really an impostor, Morga attacked her. After Sailor Moon transformed for the first time, she realized that Naru was in danger and appeared in time to save her friend. Morga then used the energy-drained women as zombie-like soldiers to attack Sailor Moon. Sailor Moon did not know what to do and began to cry, which caused her red odango covers to emit supersonic waves. The attack weakened Morga and her servants enough for the Sailor Senshi to destroy the Youma with her tiara attack.